We might not think of ourselves as dare devils, but climbing up on scaffolding, being lifted 50 feet into the air in a small bucket, or walking across narrow steel beams, are all jobs your average person would not be willing to do. We are dare devils, we just don't get the fame. Well now is the time to show off. Bosch wants to see your dare devil shots, but always remember, safety first. If Bosch likes your photo/s you could win a Bosch Circular Saw, Bosch DareDevil Saw Blades, and a Mike Metzger Autographed Truck Tool Box. You could alo win one of the weekly prizes, like, a Bosch Cordless Drill, Bosch DareDevil Spade Bits (see my video), or Blaklader Work Pants. 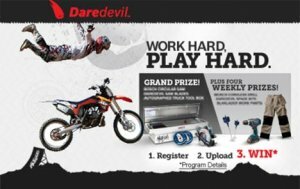 Win Big With Bosch! Be A DareDevil. "You may not laugh in the face of gravity every day like Mike here, but we bet you have a wild streak. Show us how you work hard on the jobsite, or have fun off the job. You could win serious prizes."